After a lot of use, a full-body deer archery target will get rather chewed up and won't be as lifelike. Foam targets can be a bit heavier to move around a field or forest - but the good news is that when the rut is on, the deer don’t seem to be overly concerned with all of the fine details of a decoy and will come right up to a deer target just like they would a decoy. 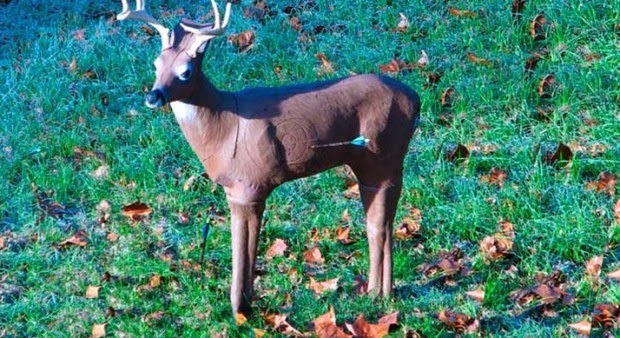 If there is damage to your deer target try to repair it as best you can before using it as a decoy. If you are going to do this, using human scent elimination is also important. Plus you should also spray the area around the target with some synthetic buck or doe scent to it, depending on whether your target has antlers or not. Don't spray the synthetic scent on the target itself as the human scent eliminator you are using might counteract the synthetic scent too. By spraying it around the decoy the deer will still come closer to inspect it, and they won't notice that the deer itself smells differently until too late.